Product prices and availability are accurate as of 2019-04-11 20:25:11 UTC and are subject to change. Any price and availability information displayed on http://www.amazon.com/ at the time of purchase will apply to the purchase of this product. 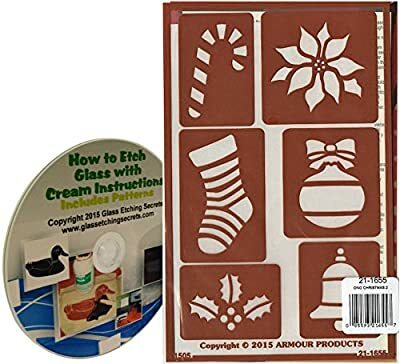 This bundle includes 2 items: Christmas #2 reusable glass etching stencils under brand name Over N' Over (number 21-1655) and 1 free How to Etch CD-ROM eBook with patterns for computer use only. The 5"X8" stencil sheet contains 6 design: Candy Cane (1.5 x 2-Inch); Poinsettia (2.25 x 2.0-Inch), Stocking (1.2 x 2.75-Inch); Ornament (1.5 x 2.0-Inch); Bell (1.5 x 2.0-Inch); Holly (2.0 x 1.5-Inch). More details: Traditional Christmas holiday themed stencils for holiday gift giving. Each stencil can be reused between 15-20 times depending on the care of use give to the stencil. For use with Armour Etch Glass Etching Cream brand, Sand Etch kit by Armour Oh, by the way, did we mention that you can also use these stencils with water based paints and even body paints. Etch or paint Christmas decorations on nearly anything easily! These adhesive-backed holiday themed stencils reduce frustration in having to cut and adhere them. Includes 6 total stencils of Candy Cane, Stocking, Holly Leaf, Poinsettia Flower, Ornament, Bell. 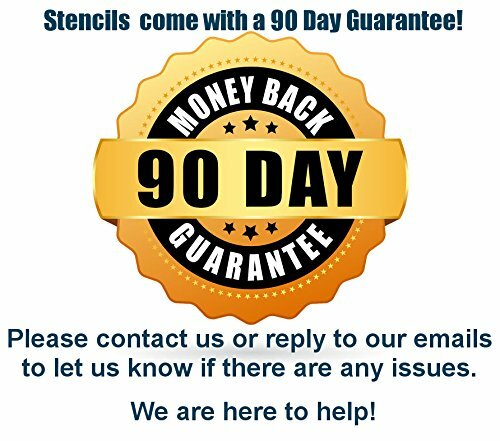 Reusable, self stick adhesive-backed stencils can be used many times to save you money! Includes 1 free how to etch ebook & patterns on CD-ROM with each order.